we are operating 95 sedan/UD taxis(up to 4 guests) and 2 wagon taxis(up to 6 guests). Please select an icon you are interested in. 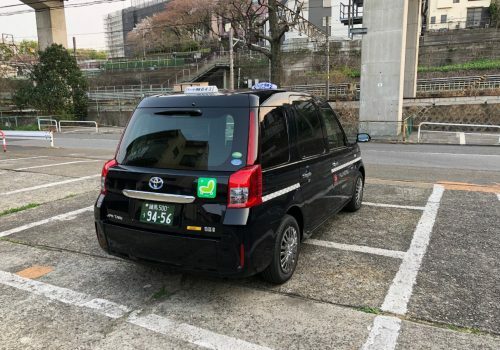 “Fixed fare taxi” is up to about 30% discount from normal meter fare, and there is no worry that the meter goes up. 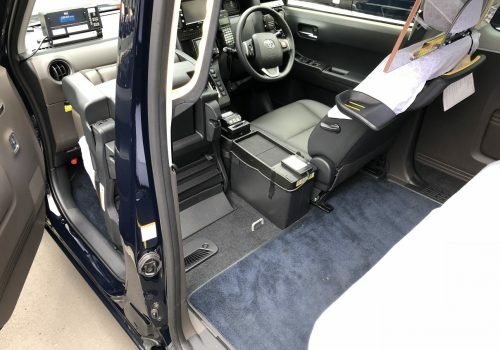 When you make a reservation, you can specify sedan (up to 4 guests) or wagon (up to 6 guests). But due to our driver’s schedule, we can not pick up from 7am to 1pm by wagon taxis. 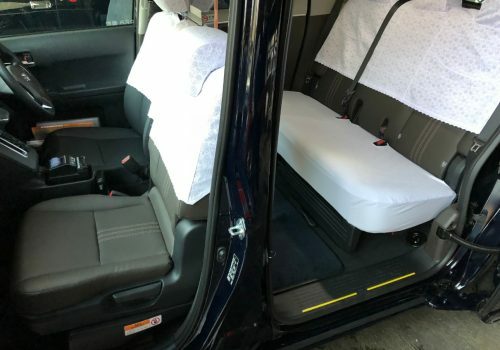 FYI, we don’t recommend reservation for sedan taxi from any Airport taxi stands, because sedan taxis including other companies are waiting at there for about 24 hours, and they also charge the same fixed fare as our’s. This fare applies from Jan. 30, 2017. Regions other than the above zones will be the usual meter fee. 22-5 o’clock fare applies if both departure and arrival are within the stated time. Reservation fee 410yen and dispatch fee 310yen are included in the fixed fare. Separate payment is unnecessary. 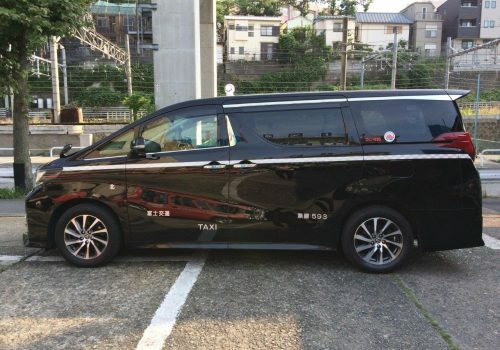 In case of specifying a wagon taxi, vehicle type designation fee 1,080 yen is charged separately. Toll road fee and parking lot fee will be charged separately. In case of cancellation or change of destination/route in the middle of transportation by customer’s convenience, usual meter fare will apply. 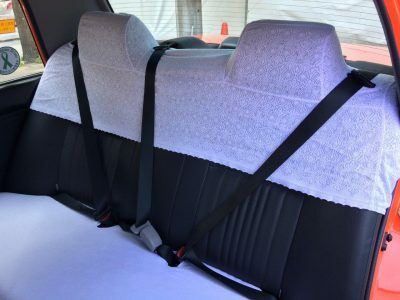 If you are traveling within approximately 15 km in an hour, you can hire a taxi at a discounted rate on a per hour by “Time charter taxi”. Destinations or route can be planned in advance or instructed on the way. We can not accept travel from midnight to early morning (22:00 to 5:00). How about such a purpose? Detail of the price : 4,650yen for the first hour, 2,110yen for every 30 minutes thereafter. Reservation fee 410yen and dispatch fee 310yen are charged separately. 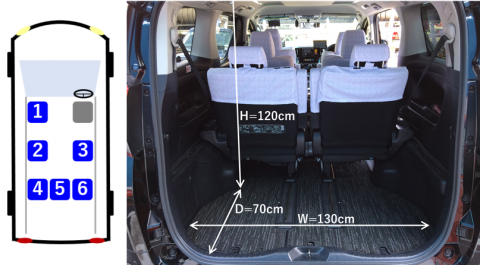 In case of specifying a wagon taxi, vehicle type designation fee 1,080 yen is charged instead of reservation fee 410yen. Toll road fee and parking lot fee are charged separately. Please use “Checker cab” telephone reception +81-3-3573-3751(24 hours). You can call the nearest taxi from our group’s 1,800 cars. 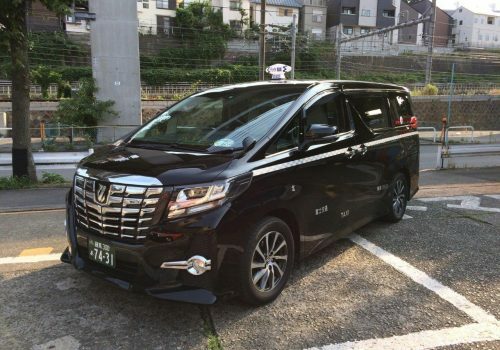 Please use smartphone app “Tokyo Taxi Takkun” operated by Tokyo Hire-Taxi Association. 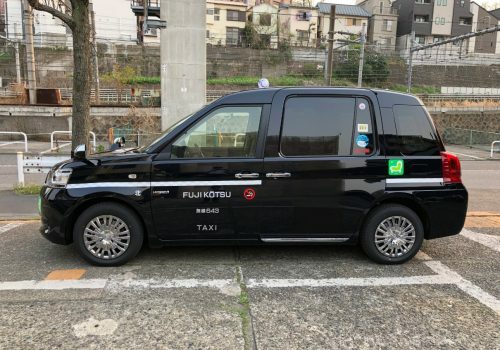 You can call the nearest taxi from partnered 9,000 cars in Tokyo. By above 2 ways, you can’t reserve or specify vehicle type. Sorry for inconvenience. For sedan and wagon taxi reservations, we currently accept only one of the following services. 1. For the reservation after one month, we once temporarily accept it and confirm again later. 2. As for the wagon taxis, we can not pick up from 7am to 1pm due to our driver’s schedule. 3. There is no cancel fee, but in case of cancellation please be sure to inform us in advance. Customers who wish to make a reservation, please contact us by our Contact us form. 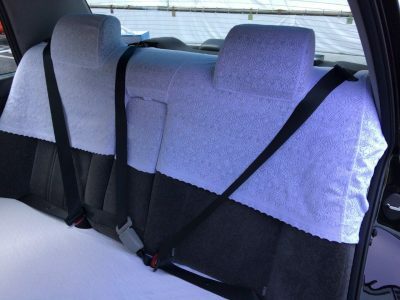 We usually operate vehicles(sedan and wagon) as a crusing taxi in center of Tokyo area. 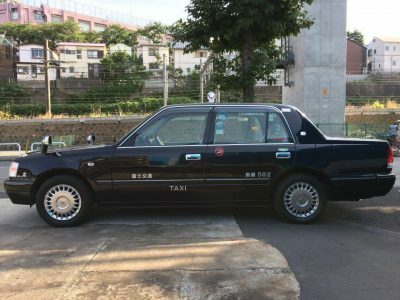 You can stop taxi with “空車” (Ku-sha means Empty) red sign on the dashboard in front of the passenger seat. 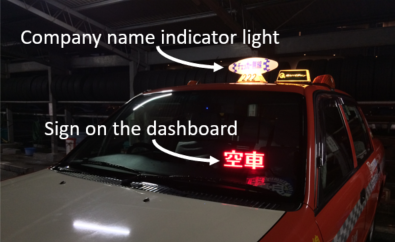 And in the night, you can also identify empty taxi by lit of company name indicator light on the roof. 1. The door opens and closes automatically for safety, so you should not operate the door. 2. In Ginza 5 to 8 areas on weekday from 22pm to 1am, you can get on a taxi only from designated taxi stands. 3. 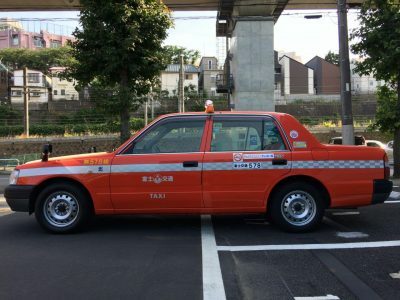 It is impossible to stop taxi for get-on/off on red color pavement in downtown area. Fares are in accordance with “Checker cab” fare system. 20% extra charge from 22 o’clock to 5 o’clock. 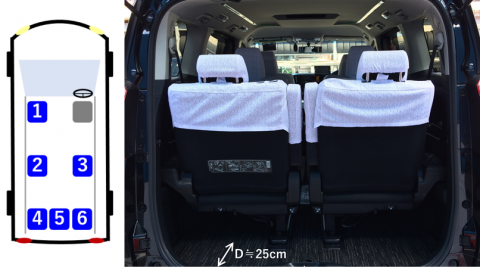 * This fare(first fare 410yen) was approved by Ministry of Land, Infrastructure and Transport on Jan. 30, 2017. 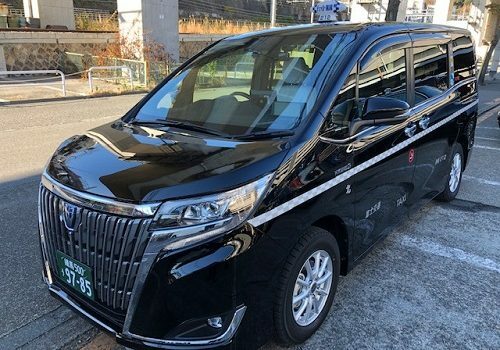 * Vehicle type request fee was approved on Dec.1, 2018. 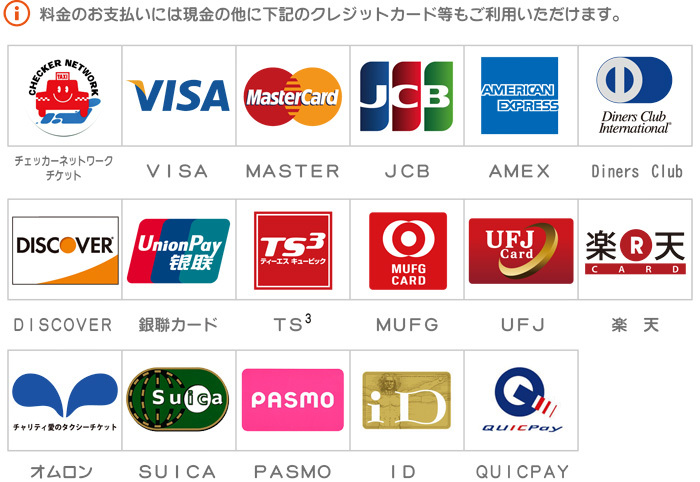 You can pay by cash (Japanese yen only) or following various cards/tickets. by telephone +81-3-3913-1181(24 hours reception,Japanese only) or our Contact us form. If you prepare the receipt of your ride, we can respond more quickly. The number of cars is as of November 1st, 2018. Our friendly color standard taxi. 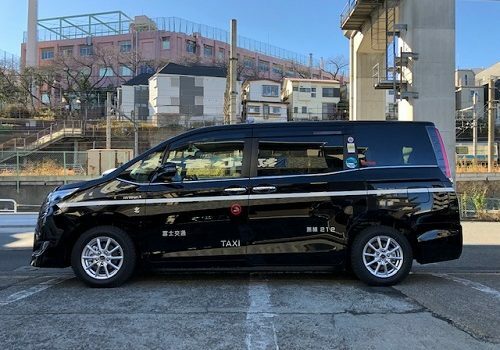 Higher grade taxi so-called “Exceed cab”.Drivers meet our original criteria such as years of experience and taking some trainings.Vehicles are also higher grade. So we can offer higher quality service. W'(118cm) indicates the width of the opening. Wagon taxi up to 6 people riding capacity. 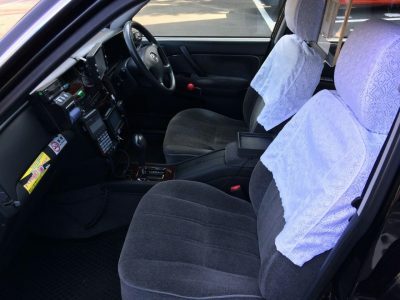 This is also “Exceed cab”, so the drivers meet our own criteria. The 2nd and 3rd row seats have enough room to sit with your legs crossed. Although the luggage room will be narrow, 2 suitcases can be loaded. This is also a wagon taxi up to 6 people riding capacity. 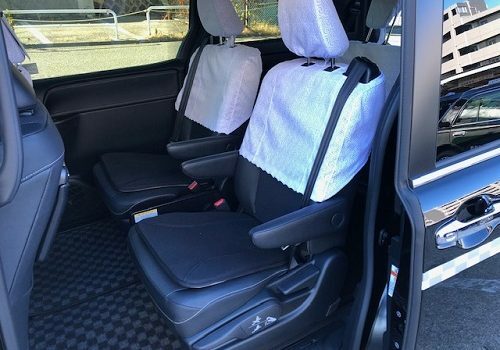 But a little bit smaller than Alphard. * We can not pick up from 7am to 1pm by these wagon taxis due to our driver’s schedule. * We can carry hand luggage only. We can not accept usage for shipping purposes such as moving. 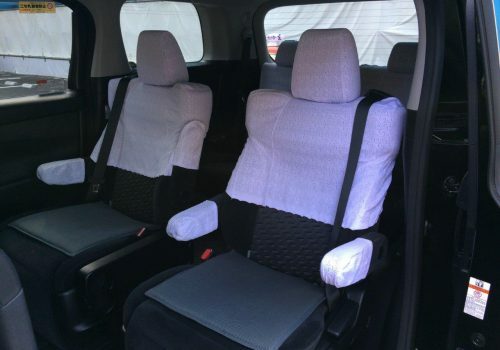 This is a new type vehicle that has a flat floor and high ceiling, easy to get on/off and move between seats. Big baggage such as a suitcase can be brought into passenger room as well as the luggage room. 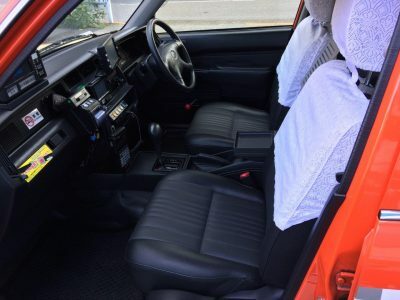 Normally up to 4 people riding capacity. 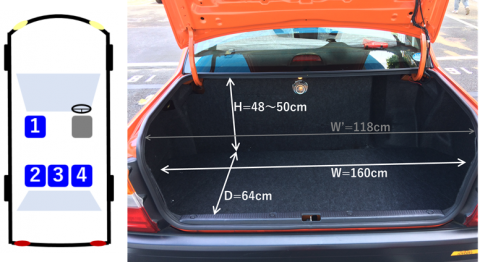 W'(103 cm) indicates the width of the opening, and H’ (53 cm) indicates the height to the tonneau cover. Fujikoutsu Co., Ltd. (hereinafter referred to as “our company”) establishes the personal information protection policy as follows and establishes a mechanism for the protection of personal information for handling customer’s personal information. We will comply with laws concerning personal information, thoroughly recognize and address the importance of protecting personal information and promote appropriate handling and protection of personal information. In order to keep customers’ personal information accurate and up to date, to prevent unauthorized access to personal information, loss, damage, falsification, leakage, etc., we do maintenance of the security system, improvement of management system, training of employee education and we manage personal information strictly. On this website, we may register personal information such as name, e-mail address, telephone number etc at customer inquiries, but we will use these personal information only for the original purpose. In order to prevent the leakage / loss of personal information and to ensure accuracy and confidentiality, we will take thorough measures for security. If you wish to inquire, modify or delete personal information of the person himself / herself, we will confirm that you are the principal and then we will respond. We will comply with Japanese laws applicable to the personal information we possess, review the contents of this policy as appropriate, and make efforts to improve it.